A tow truck driver from Ashkelon shot to death two Palestinians on Sunday who he claims had tried to rob him in the south Mount Hebron area. Another Palestinian was injured in the incident. Sources at the Shai District police said that the driver was beaten by the Palestinians and was lightly injured. Despite his injury, the driver shot at the suspects, who were killed as a result. The Palestinians' bodies were taken to a Palestinian hospital in Hebron. Security forces canvassed the area and launched an investigation into the incident. The driver sustained head and neck wounds and was taken to the Soroka Medical Center in Beersheba. Ynet has learned that the driver, a 52-year-old resident of Ashkelon, obtained a firearms license in 1994. 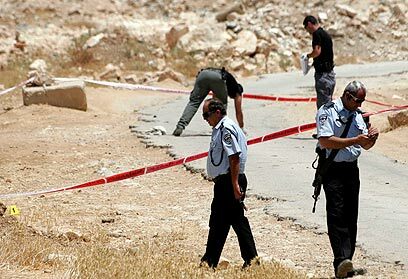 According to the investigation, the Palestinians called the driver and asked that he tow a tractor in Mount Hebron, but when he arrived they struck him with clubs and iron rods and managed to drag him out of the truck. The driver, who was lightly hurt, recovered and fired two shots at the Palestinians as they were trying to push him back into the truck. He told police he feared they were attempting to kidnap him. Two of the Palestinians were killed, while a third, who was injured, fled to a Palestinian hospital in Hebron. 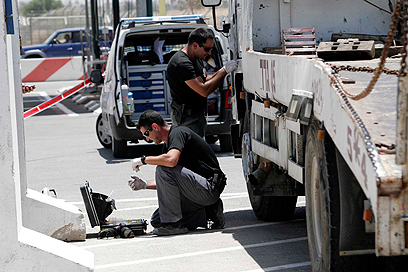 The Israeli driver rushed to a nearby IDF checkpoint to report the incident. Palestinian sources identified the victims as Naim Nijar, 34, who was shot in his head and neck, and Anwar Abed Rabbo, 35, who was shot in his chest. The sources said there may be other wounded Palestinians. Palestinian President Mahmoud Abbas condemned the killing of the Palestinians, who were construction workers. "These settlers commit crimes under the auspices of the Israeli government and the IDFA," he said, apparently unaware that the truck driver is from Ashkelon. 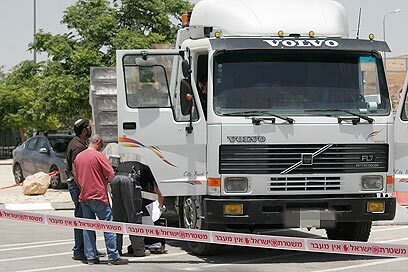 An initial IDF inquiry indicated that the Palestinians had likely tried to rob the truck driver. Large IDF forces arrived at the scene to examine whether the incident could have resulted in a kidnapping. Last month, Shin Bet chief Yoram Cohen said that the past year has seen a rise in terrorist attacks carried out with non-firearm means. He noted that 50% of West Bank terror is carried out by Hamas and that out of 28 foiled terror plots, at least 18 were organized by Hamas. The Shin Bet chief noted that only a few of the Shalit deal detainees resumed their terrorist activity after their release, and that 2,000 terrorists were arrested in the past year. See all talkbacks "Truck driver kills 2 Palestinian robbers"